SMARTS (Social Media based drug Addiction Recovery intervention Targeting web Server) is a web server that utilizes supervised machine learning, natural language processing, and causal analysis techniques to automatically determine high yield responders to drug addiction recovery interventions. SMARTS can further assist the epidemiologists and public health officials in analyzing the sentiment of the posts, identifying the drug, and recovery terms, different topics, and the location information present in the posts of the users. SMARTS is part of our effort to provide publicly available technologies that can be used by epidemiologists to identify individuals open to drug addiction recovery interventions and help curb the opioid epidemic. The Quantal Dose Response Calculator 2.0 (QDREC 2.0) is full service tool set for the deep quantitative analysis of macro parasite screening data leveraging time series phenotype representations as a holistic improvement on previous image based representations. QDREC 2.0 supports supervised and unsupervised machine learning based analysis as well as advanced visualization tools to provide a framework for the study of drug-phenotype relationships. SMAL (Scaffold-Based Multiple Network Aligner) is a public, open-source, web-based application for obtaining alignment of multiple protein-protein interaction (PPI) networks. SMAL works by combining multiple pairwise PPI network alignments into a single multi-network alignment. The software also offers a framework for obtaining pairwise network alignments as well as functionality to modify, visualize and interact with alignments. MS2DB++ is a web application for determining the disulfide connectivity in proteins using an information-fusion approach based on Dempster-Shafer theory (DST). The software provides different methodological frameworks for determining S-S bonds and combines the results automatically and rigorously using DST. MS2DB+ is an open-source, platform-independent web application that efficiently determines the disulfide linkage in proteins based on mass spectrometry data and machine learning techniques. Quantal Dose Response Calculator (QDREC) is an interactive web-application for segmentation, annotation and automatic classification of schistosomula. QDREC identifies parasites which differ significantly from controls and uses these data to compute phenotypic response characteristics (time- or dose-response curves) for different drug compounts or experimental conditions. Residue Contexts is a web server for flexible and non-sequential protein structure alignment with a novel algorithm which employs biochemical and structural features. 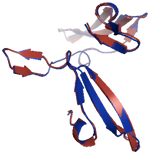 The Protein Space Explorer is an open-source, platform-independent web application for direct exploration of protein structure space in 3D. XMAS is an open-source, platform-independent web application for a new type of interactive, "sit-forward" microarray analysis.